It was Satan who delivered the religion of Islam to the prophet Muhammad. 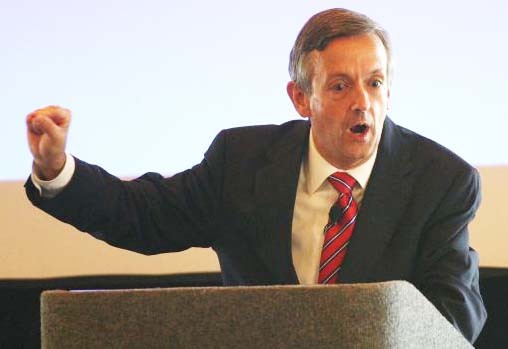 Pastor Robert Jeffress kepts on telling the truth from the pulpit. Jeffress added that just as the Antichrist will seek to rid the world of Jews and Christians, religious minorities across the world are being killed and persecuted at an alarming rate by Islamic radicals who feel called by their faith to commit such acts. Terrorist organizations like ISIS, al-Shabaab and Boko Haram are frequently attacking and killing thousands of Christians and other non-Muslims in the name of their jihad. The Koran rejects that God has a Son. The Bible claims that God will send us a child, who will be called Mighty God. Either the Koran or the Bible is a fraud. It is impossible that both can be truth. It is fantastic that Pastor Robert Jeffress tells 11.000 people the truth. May this Baptist pastor be blessed. The Bible is crystal clear that all who do not have the Son, will perish. God’s wrath will remain on them. To all Muslims all over the World. You have been deceived by an Arab named Muhammad. Reject the Koran as falsehood. And turn to the living God. Make Jesus the Messiah Lord and God. Only He can save a man from his sins. Please listen. Keeping the crusaders stirred up. The pope seems to be doing alright during all this, even seeming to prosper. Does anyone have any fear for the Vatican during all this? Even Mohammed wasn’t sure that the “revelations” he received from the supposed “angel” were from God and wondered if they were from a demon. But his Roman Catholic wife apparently convinced him that it was “from God” and the rest, as they say, is history. Satan was, from the beginning, obsessed with getting people to deny Christ. You can see it in the New Testament in 1 John where John says that anyone who denies the Son is antichrist. Many pagans were, even then, denying that Jesus is the Son of God–well before Islam. Mohammed was confused, to say the least. Many Christians feel that Islam was invented by the RCC in order to pull Christians away from the Bible which was often at the centre of their dispute with the Eastern Church. Even then, the RCC was trying to replace the authority of the word of God with the “authority” of men who are influenced by Satan. Half the Jews were denying Jesus was the Son of God seconds after anybody said he was. Long before there ever was a RCC there were false Apostles, most likely Jews. Pagans were more likely to believe in Jesus or not care because they weren’t pushing it on anyone.. It upset the Jews more than anyone. “certain of the JEws set out to kill Paul” etc. Jesus told the Jewish leaders who didn’t believe him, the teahers who should have knows, the synagogue of Satan. Islam sort of resembles Judaism in many ways. Like the jews were trying to steer them away from Christianity but without them becoming Jews. And your point is, Ed? Wondering where Islam really came from. Herod persecuted the Christians because it pleased the Jews. Islam says Jesus was a Jewish Rabbi but not the Son of God. Which pleases the Jews. The Catholics say Jesus was the Son of God but plays down his jewishness, detaching him from Judaism by changing the Sabbath and the feasts, and everything else. Which pleases the Jews. What you write is antisemitism in the name of “Christ”. To defame the Jewish people at large. Yes, there are Jews who belive in a different Messiah, and are filled with the spirit of antichrist. Like some Orthodox sect. But the large majority of religious Jews do belive that the Messiah is comming. When you belive that the Messiah has not come, you do not follow a replacement. A copy. The large majority of claimed to be Christians do belive “Jesus” is the Messiah. But they do not belive their “Jesus” is a Jew, love the Jewish people, has restored the Jewish homeland, etc. It is imposisble for a God fearing Jew to belive in surch a Messiah. And in fact. He should not. This kind of a Messiah is surely a “different Jesus”, and an anti-Christ. This kind of “Jesus” falles into the trap of Islam, and side with the Arabs to rob the Jews of their homeland. Said the same thing basically. Jews in a general sense do not believe that Jesus is the son of God. Yes their are Jewish believers who do believe that he is and have placed their faith in h alone for their faith in him. But my point was that in the time of the New Testament writings Jews,(Jews who did not believe in Yeshua as the son of God who was their messiah)were the largest group who denied that he was the son of God. That is undeniable Ivar. That was all done in the spirit of anti Christ. Everyone who do not believe in Jesus, is not filled with the spirit of antichrist. This is a false doctrine. You are targetting non-beliving Jews. Your statement is antisemitic in natur, and must be rejeted as falsehood. Those who have accepted a false Christ, is filled with the spirit of antichrist. Among hundred of millions of gentiles who have been decived, there are also Jews. This is true. Even Muhammad was confused as to whether his vision came from God or the devil. The Roman Catholic Church is behind Islam. This is why the pope has opened the sanctuary to the heathen, as prophesied in the OT. Are you insinuating that the Jews created Islam to defeat Christianity? That has certainly been speculated but the thesis is doubtful because Islam has not only opposed Christians but Jews as well. One would think that they would have been more clever about it had it been a deliberate plot. Jews as well as Christians were subjugated under Islam. The Jews have suffered immensely over the last 2,000 years and Islam just inflicted further harm on them. Not sure what kind of a thesis you are pursuing but I don’t think it works. Allah is Satan disguised as the angel of light. The Qu’ran encourages terrorism and beheadings while dismissing the crucifixion of Jesus as a hoax. Yes, Islam is devil worship; bowing down to Satan 5 times a day. Where their worm dieth not, and the flame is not quenched. This calls for patience of the saints. Our glorious Lord Jesus Christ shall utterly destroy the wicked. Amen. The invention of Islam served the RCC much more than it ever served any other group. At the time that Islam was invented, the RCC was in a dispute with the Eastern church as to whose teachings were going to be authoritative on all things Christian. The RCC benefited greatly from the rise of Islam. Islam ultimately overran the Eastern Church and helped to make Rome the undisputed “head” of the faith. Judaism was always opposed by Rome–almost from the beginning of the RCC. Among the many groups the RCC persecuted, in its drive to power, Judaism was just another group that got in its way. Augustine paved the theological way for the persecution of Jews instituted by the RCC from his time forward. And the RCC is still at it today in their support for the Islamic enemies of Israel. you are very correct on the creation of islam by the rcc! i thought it was because of the rise of the reformation that they created it. a great page you may enjoy too is ‘islam and catholicism-ties that bind’- it outlines the many similarities between the 2, praying to beads, veneration of mary, Jesus being the lesser role, etc. anyhow, i do hope you enjoy it Sir! In addition, there has never been any evidence that the RCC ever persecuted Islam. Why not?–they persecuted every other group. Perhaps it was because Islam was serving the desires of those in control of the RCC. The last blessing in the Bible (Rev 22) is to those who keep His Commandments. Mr Jeffress is correct to point out that the ‘church’ of rome is evil and islam is the creation of this evil entity, he still fails to keep the Lords Day Holy, as God Commanded us in the Bible. Many just do not realize that the mark of the beast is going against the will of the Lord. And to forsake the Holy Sabbath is to go against the Lord! There are a LOT of people who fit into that group. Islam would be number one in that category. But everyone who fails to acknowledge that Messiah Jesus is the only way to Heaven, denies that He is the Messiah. And that includes a HUGE number of people. When we do not understand that the Bible is a message written by Jews for Jews, we end up making false doctrines. in Jeruslaem, the large majority of the Jews awaited the Messiah. But they expected a king that would liberate them from the Roman occupation. When Jesus refused to lead a rebellion, many Jews rejected that He possible could be the Messiah. Many Jews started to seek for someone else. That is the spirit of antichrist. There are hundreds of false Messiah throughout the history of the Jewish people. But a high number of Jews accepted His Lordship when He walked on the face of the Earth. And there are three hundred thousand Jews in America who belive in Him, and several tens of thousands inside Israel. These numbers are rapidly increasing. The most prominent false Messias’s in the gentile camp, are with us today. 1. The replacemnet theology “Jesus”. 2. The Muslim “Isa” (Jessus”. 3. The Roman Catholic “Christ”. 4. The “Jesus” of the latter days saints. 5. The “ATM Jesus” of the Word of faith movement. 6. The “Jesus” of the Jehova Witnesses. We do live in a challanging time. We have to read the Bible as a Jewish book, to understand the full message. As gentiles we have been grafted into the true faith in God of Israel. If God of Israel is not our God, we have made our self a suitable idol. Christ and deny the Father and the son. Their are many who fit into this category. Repented from denying and turned to believing. I hear of many Muslims converting to Christianity, I do not hear of the opposite; Christians converting to Islam. Their May be some. But they were among us but not of us as John has said. Their are many copy cats. I am well-aware of all that you cite, Ivar. But I think it is a bit of a stretch to say that the entire Bible was written “by Jews for Jews”–you limit its scope by saying that and it would allow Gentiles to disregard it as a “Jewish book”. The Bible begins with the history of man before God chose the Jewish people. It is not just a Jewish book. It is a book for every human on the face of the planet. The Holy Spirit is the real author of the Bible and Gentiles are included in the care of God the Father. They are mentioned frequently in the Old Testament as well as the New Testament. Yes, it is true that the Jews were chosen to be the bearers of God’s light to the Gentiles but faithful Gentiles bear the light back to the Jews in these Last Days. Remember that Jesus was astounded by the faith of the Roman Centurion and Luke, a Gentile physician penned two books of the New Testament. The Apostle Paul considered himself to be the Apostle to the Gentiles. We are the “sheep of another fold” mentioned by Our Lord Himself. Gentile believers will figure prominently at the End. Jesus cited the queen of Sheba, a Gentile believer: “The queen of Sheba[a] will stand up against this generation on judgment day and condemn it, for she came from a distant land to hear the wisdom of Solomon. Now someone greater than Solomon is here—but you refuse to listen.” As part of the Church, many Gentiles will judge the angels who rebelled. It is a false humility that insists that Noah and Enoch were not as important to God as were Abraham, Isaac and Jacob. Noah and Enoch were Gentiles. All human beings are made in God’s image and are important to Him. Yes, the Jewish people are the “apple of His eye” but we diminish God the Father when we say that “the Bible is a message written by Jews for Jews”. The Bible begins with the history of man before God chose the Jewish people. It is not just a Jewish book. It is a book for every human on the face of the planet. I never said the Bible is only for Jews. To the radical opposite I have always claimed that the gentiles can read the Bible, and find salvation and peace. What I have claimed is that the Bible is a book written by Jews for Jews. Adam, Enock, Noah, etc, did not write anything. It was Moses, of the tribe of Levi, who wrote down the first five books of the Bible. Or someone close to him. God told Moses what had taken place since the creation. God orded Moses to tell his own people, and to write down every word. It was the Jews who carried the law. Physically in Torah scrolls. With the risk of loosing theif life. The Jews maintained the Word of God in written form, from generation to generation. If not, there would not have been a Bible today. Ps. The Bible Jesus had was the Hebrew Bible. My reply: The New Testament Book of Jude, quotes from the “Book of Enoch”. Whether it was actually penned by Enoch is irrelevant–it was very likely to have been written before Moses penned the Pentateuch (Torah). It is reasonably certain that Moses had source material for the Book of Genesis. It is also very likely that the Book of Job preceded his writing down of Torah, since it dates itself by the events recorded, as being in the range of 2,000 to 1,800 B.C. and Moses was likely born at least 400 years later–in or around the year 1,393 B.C. Jewish tradition regards Moses as the author but others have suggested that Job himself was the author. I believe the latter. Moses, however, may have copied it. My reply: No doubt true, and we owe them a debt of gratitude for their faithfulness. My reply: Why would you think that I would think anything else? The early Church relied on the teachings in what we would call the “Old Testament” AND on the teachings of the Apostles who walked and talked with Jesus Himself. My reply: Why would you think that I would think anything else? And my second reply: I just made a statement. I did not presume you would disagree. The book of Enoch is not a part of the Hebrew Cannon. It was written down ca. 300 B.C, many thousand years after Enoch walked with God, and was suddenly not there. The book of Enoch is not mentioned in the 5 first books of the Bible. Moses lived around 1200 B.C. Also the book of Job is younger than Moses. It is most likely written down ca. 600 B.C. Since Moses do not mentioned Job, we must preume that He lived after the Exodus from Egypt, and Moses not aware of this great man of God of Israel. I did not say that the Book of Enoch was part of the Hebrew canon–but it was known at the time of the writing of the New Testament–and was quoted. It was thought to be of very ancient origin and ascribed to Enoch (by tradition), the great-grandfather of Noah. The original language may have been an early form of the ancient Ge’ez out of Africa but it could go back far into the oral tradition before being written down. Just because the Book of Enoch is not mentioned doesn’t mean that they did not have his testimony (or Adam’s) as part of the oral traditions. Of course, Moses could well have had God alone as the source of all that he wrote. But it does seem that God entrusts His oracles to people, to carry forward. Over the thousands of years since the Creation, He has not had a great deal of direct contact with mankind–especially after the Fall. There is no doubt a reason for this, but we may not know what it is, this side of Paradise. You must be careful how you search for “facts”, to support your hypoteses. Like taking truth from a small Seven day adventist website in the USA, and say: “Here it is”. This website do confirm that the Jews claim that the book of Job was written by Moses. “We do not know who wrote the book of Job. The Jews have always believed it was written by Moses. Since the Law of Moses is not mentioned, this indicates Job lived before the Law was given at Mt. Sinai. The book of Job shows the way of life which was common during the Patriarchal Age”. When you link up such stuff, at least quote the site correctly. But be aware that this is quasi-science, without any references. An opinion among many opinions. You and this site agree that you want to set aside hundreds of years of Jewish knowledge about their own Bible. I agree that the book of Job is a difficult issue. But different views on the date and origin of this book, do not change the validity of my statement: “The Bible is a book written by Jews for Jews”. John 14:6 Jesus replied, I am the way; I am the thruth and I am life; no one comes to the Father except by me. James 1:26 a man may think he is religious, but if he has no control over his tongue, he is deceiving himself; that man’s religion is futile. That’s a good one Jose Carlos Silva. James 1:26 going farther. 27 Religion that God our Father accepts as pure and faultless is this: to look after orphans and widows in their distress and to keep oneself from being polluted by the world. As sinners we have enough problems without worrying about Islam. The destruction of the antiquities is so heart braking to see in Syria,they are mad men bent on wiping out the worlds history of religion as if nothing else was before Mohammad….They shoot rabid dogs dont they???? My reply: I won’t argue any further–it really doesn’t matter what I think or what you think or even what “scholars” think (they are all over the map on many theological issues anyway). I am “not a prophet nor the son of a prophet”, and neither are you. What matters is that God’s truth is there in the Bible for ALL to see and believe and be saved eternally. I could agree with you, had you said that, “The Bible is a book largely written down by Jews, as God’s amanuensis people, chosen to be ‘a kingdom of priests, a holy nation’, in order to bring all humankind to a saving knowledge of His truth.” Cumbersome, but represents more of the truth. Your statement makes God out to be the God of the Jews only. Yes, they are a precious people to God and because of that, they are (or should be) precious to all of God’s people in the Church. The whole of the Church has largely ignored “to the Jew first” to the likely sorrow of the Lord. But the question is, Why were they chosen? Jesus Himself gave the answer in speaking to the Samaritan woman: “You Samaritans worship what you do not know; we worship what we know, for salvation is from the Jews. But an hour is coming, and now is, when the true worshipers will worship the Father in spirit and truth; for such people the Father seeks to be His worshipers. God is spirit, and those who worship Him must worship in spirit and truth. The woman said to Him, ‘I know that Messiah is coming (He who is called Christ); when that One comes, He will declare all things to us.’ Jesus said to her, ‘I who speak to you am He.’ ” (Gospel of John 4:22-26) Since the Fall of man, every movement of God has worked toward that reality. We have received an immeasurable blessing through the Jewish people–our Messiah, Jesus. But, tragically, “His own knew Him not” and it is our duty to show them the Truth in these Last Days. God’s mercy, in giving His Son to the Bride of Christ (largely a Gentile people who were not even looking for Him) is the highest expression of God’s love to mankind AND to the Jewish people–“salvation is found in no one else” but Jesus. You do not help them when you make the Jewish people into more than they were and are. In Matthew 3:9 we read the inspired and scolding words of John the Baptist, (arguably, the last of the Old Testament prophets), “And do not think you can say to yourselves, ‘We have Abraham as our father.’ I tell you that out of these stones God can raise up children for Abraham.” Love tells them the truth–that rejecting their Messiah, as the nation of Israel, was a terrible sin and that, in doing so, they rejected their God-given role of being His holy nation of priests and receiving, at that time, the Kingdom. BUT, He has a redemptive plan for the nation of Israel–“in the End, all Israel will be saved.” (Romans 11:26). The Apostle Paul emphasized in that passage that God’s mercy is for all people, even though his passionate desire was for his own people, the nation of Israel, to believe in Jesus and be saved. Our God is a God of many chances, “slow to anger and abiding in love”. However, He is also a God of LAST chances. In the end, no one will be able to appeal to “Father Abraham” for help, if they turn their backs to God in this life. In Luke 16:19-31 we read Jesus’ account of how the deceased wealthy Jewish man appealed to “Father Abraham” from the “place of torment” but Abraham could not help him. I pray that the Lord humbles the nation of Israel and shows Himself to them in a mighty way. That now, in these Last Days, they will know their Messiah and become what He meant them to be so many centuries ago. I know that He will because that is what He says in His word–because He loves them. He loves His Bride too. I wish our immigration policy were based on God’s Word. In 2John 1:10-12, it says that If anyone comes to you who is not bringing the same (Christian) doctrine, do not receive them and do not wish them well. If you do so you are a participator in his evil deeds. Bottom line is God does not like diversity of doctrine or religion. Just imagine an America where everyone loved and obeyed Christ Jesus The Lord! Now that would be great!